Please stop using the command line when you’re writing articles telling us how wonderful Mercurial is. I don’t need to be convinced that it is superior to Subversion. I’ve been using it for about nine months alongside our central Subversion repository at work, as well as for my private projects at home, and there’s no doubt in my mind which is better by a long shot. Easy branching and merging, and local versioning for experimental development and refactoring, are killer features as far as I’m concerned. And ease of use is supposed to be its big selling point over git. But other developers do need convincing, and if you’re apparently fanboying the command line, it doesn’t help. In fact, it’s downright embarrassing. Remember, you may be a Linux geek who writes code for fun at weekends, but most of them are nine to five Windows developers who switch out of code mode the minute they leave the office and don’t want to have to learn anything new unless it’s strictly necessary. To them, it looks elitist, arrogant, off-putting, and Luddite. When I first heard about Mercurial and git about two years ago, neither of them had any form of graphical user interface to speak of. It was a case of hg this, hg that, git this, git that in a command shell versus TortoiseSVN’s repo-browser, show log and commit dialogs. You know, like, where you can actually see what you’re doing? Where you can frequently figure out what you need to do by experimentation and educated guesses rather than having to wade through a morass of man pages? Forget it, I thought. Come back to me in a year or two’s time when you have a decent graphical front end for it. In the meantime, I’m sticking with TortoiseSVN. Heck, I’m the kind of developer who likes to try out new things. I like Linq, and MVC, and jQuery, and Python, and IOC containers, and Colemak keyboards. I know Linux and I’m not afraid to use it. If I was put off by the impression that Mercurial was command-line only, what hope do you have of convincing the rank and file Windows developers who are scared of the command prompt? 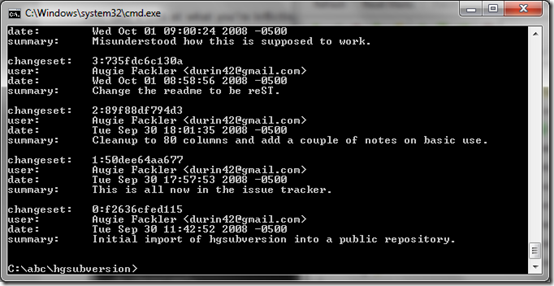 To a seasoned developer, there are advantages to the command prompt. It’s easier to type into your blog, easier to copy and paste, and easier to script. But there is a time and a place for everything, and introductory tutorials for tools with perfectly good graphical front ends are not the time and place for a command prompt. Doing a screen capture, firing up Paint.net and cropping your image to the right size may be more of a faff, but in an introductory tutorial, merely typing hg push instead is either outright elitism or sheer laziness. Please, cut it out. Use TortoiseHg to introduce Mercurial, and keep the command line for more advanced tasks. Posted at 08:00 on 8 March 2010. I have no problem using the command line (though I can’t stand windows’ cmd) but it just cannot be compared to the productivity that GUI gives you. I could be great for script but for most tasks (your screenshots are a good example), it’s just not practical.